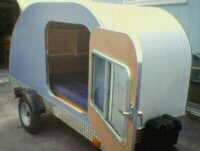 Teardrops n Tiny Travel Trailers • View topic - ITG3 help! I am looking for a little help. I have 6 10" dutch ovens that are currently located in St. Louis, MO. I am looking for someone that will be traveling to Minden for ITG3 that might be able to pick them up and bring them to the gathering. Space required will be just under 6 cubic feet [each item is about 12" X 12" X 10" and there are 6 of them]. Each item weighs just over 8lbs for a total of about 50lbs. If you will be traveling east to west through St. Louis between now and June 16th or so and would be willing to help relay these Dutch Ovens, please give me a PM! I have offers to help with a relay.